Cookies are awesome. They’re simple to make, tasty, you can freeze the dough and you can eat it raw if you want to. I love them all. If I had to choose to only make one type of cookie for the rest of my life though, I would choose these. Well, I’ve got to admit that the main reason isn’t even in their name – it’s the cinnamon in them that I would gladly give up the chance to eat any other type of cookie for. It might not be the first flavour you’ll taste in them, but it’s there, and it gives the cookies a wonderful warmth that just wouldn’t find otherwise. 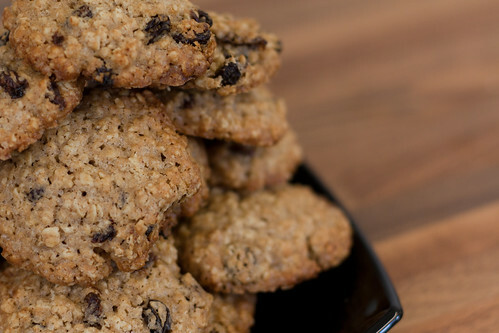 Don’t get me wrong, the oatmeal gives the cookies a wonderful chewy texture, and the raisins give a brilliant juiciness, but it’s the cinnamon that does the job for me every time. So, chances are, if I say I’m going to be making you some cookies I’ll probably be making you The Oatmeal and Raisin cookies. Om nom nom. Makes 25 small cookies, and takes about 20 minutes all told. In a separate bowl, combine the egg and vanilla extract, before adding these to the creamed ingredients and mixing lightly. In yet another bowl combine the flour, baking powder, salt and cinnamon. Then, you guessed it – mix this slowly into the creamy eggy mixture. I tend to do this a third at a time to make sure everything combines together. Finally, mix your oatmeal and raisins and add them to the mix. Make sure everything comes together, cover and place in the fridge. Ideally, leave your mixture in the fridge overnight, but if you can’t wait then make sure you leave it in there for at least half an hour. The reason we do this is to let everything firm up again, which in turn means that the cookies won’t spread to cover your entire baking tray when you cook them. Once your cookie dough is fully chilled, use a tablespoon to remove small chunks, which you should form into balls. 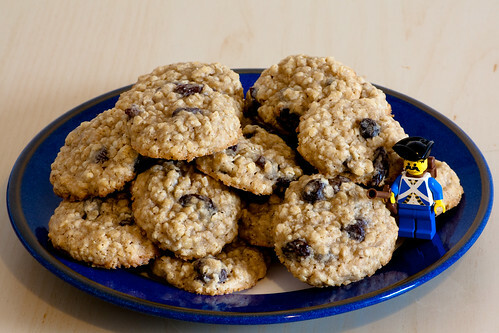 Place them on a baking tray – I tend to fit nine cookies on a tray. Try to handle your balls as little as possible – you want them chilled, remember? Bake for 11 minutes. Allow to cool sightly before removing from baking tray and then leave to cool on a cooling rack. Alternatively, put a couple of cookies in a shallow bowl with some good quality vanilla ice-cream and nom.